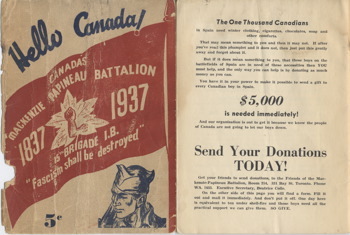 those who fought for Canada in the First World War (1914-1918), the Second World War (1939-1945), and the Korean War (1950-1953), as well as those who have served since then. More than 1,500,000 Canadians have served our country in this way, and more than 100,000 have died. the sole surviving veteran of the fine Mackenzie-Papineau Battalion and his deceased colleagues should be afforded the same courtesy that has been given by the government of Canada to Japanese Canadians and First Nations people: an apology for discriminatory treatment by previous administrations [as] the political beliefs they may have held from 1937-39 should not be held against them when it comes to being honoured for their sacrifice. they were fighting for Communism. None of them was fighting for either Canada or democracy. In those days, Communism was seen as a bigger threat to democracy than fascism. Bravery alone isn’t enough to be treated as heroic; you have to be on the right side of history. These volunteers weren’t. rewards were personal, individual, and shouldn’t be inflicted on the country. They were brave, dedicated and initially naïve about a war that was not Canadian. We should recognize and honour our own soldiers — not adventurers who join other causes. The difference between, say, those who advertently or inadvertently went to fight for communism in the Spanish civil war, and Omar Khadr who went to fight for al-Qaida in Afghanistan, is an academic one. Also on June 2, in Winnipeg, a Chilean refugee who fled from the political prisons of Gen. Augusto Pinochet, Francisco Valenzuela, wrote about a Mac-Pap veteran he met in 1950 in Chile. He told me that he decided to find peace and a new home in Chile because his Canadian government treated him as a “traitor and communist,” although he was a devoted Catholic from Quebec. He said he was unable to get a job or security as a veteran. How ironic it is that these brave volunteers were unwelcome in Canada after risking their lives for the survival of the British Empire, which was almost defeated by the mighty German military power. At least one writer is willing to give them their due.